If you have a nut allergy, just replace the almonds with toasted sunflower seeds. I prefer to use toasted almonds, but if you are in a hurry natural almonds will work perfectly in this recipe. Place the almonds in a food processor or Thermomix, and blitz until roughly chopped. Add the chopped apricots, and process until a crumbly meal is formed. Add the coconut butter and process until the mixture starts to come together. If the mixture doesn't seem to be holding together, add the extra 2 Tablespoons coconut butter. The mixture will still seem quite crumbly but will hold together once you shape the balls. Take a Tablespoons of mixture in your hands and gently press it together to form a ball. Don't try to roll the ball as it will fall apart. Just gently but firmly press the mixture until it stays together. Trust me, it will happen. Place the balls on a tray and allow to set in the fridge for 30 minutes, or until cold. Keep in a sealed container in the fridge for up to two weeks. As you shape the balls, the toasted coconut butter will begin to melt slightly with the warmth of your hands. This is why the balls stick together. 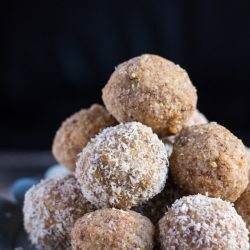 If you wish to coat the balls in desiccated coconut, roll the balls straight in the coconut after shaping. The coconut will stick to the melted butter. If you allow the balls to cool slightly after shaping, the butter will set and the balls will be far more difficult to coat with coconut.